Fraser Watts observes the Christmas Story. What is going on in the Christmas story? The Bible seems to contain various different kinds of material, and they come jumbled up together, without anyone bothering to flag up what is what. We are left to work that out for ourselves. tine realised that ages ago, and wisely said that if people tried to defend the literal truth of everything, they risked discrediting the whole lot. 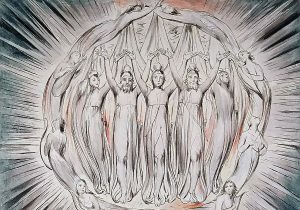 The Annunciation to the Shepherds by William Blake. What kind of story is the Christmas story? If you rate it for how much historical fact it contains, it surely rates much lower than the crucifixion of Jesus, lower even than some of Jesus’ healings. Also, the story doesn’t seem important to several Biblical authors. Paul, John and Mark don’t mention it at all. Like the story of creation at the beginning of Genesis, it seems to be saying something important (and basically true) about the nature of Jesus and his place in the world by telling a story about his origins. It is what some scholars call a ‘myth’, though that is not saying that it is untrue, just saying that its truth is symbolic. It is no accident that the most popular story about Jesus is a story that is more symbolic than historical. It speaks to the heart and stirs imagination. But I don’t want to fall into the trap of saying it is just symbolic and not factual at all. It seems to belong to an in-between world. The psychoanalyst, Donald Winnicott, talked about a ‘transitional’ world that was ‘inside, outside, at the border’. The Christmas story seems to belong to that in-between space. In fact, that is perhaps the power of the story. It speaks to us of an enchanted world and holds out the promise that our rather dreary, problematic, everyday world could become re-enchanted. It would be a world in which we are at peace within ourselves and in our relations with other, in harmony with nature, and at one with the transcendent and spiritual. I believe that re-enchantment is a real possibility, not just a pipe dream. However, it is not going to fall into our laps; we are going to have to work to make it happen. I hope that the Christmas story will not just be some passing sentimentality, but will encourage people to hope for, and work for, the re-enchanted world of which it speaks. The adult Jesus (Yeshua) points the way forward towards it.